RIT’s Women in Computing and Women in Engineering groups were recognized by the Girl Scouts of Western New York. 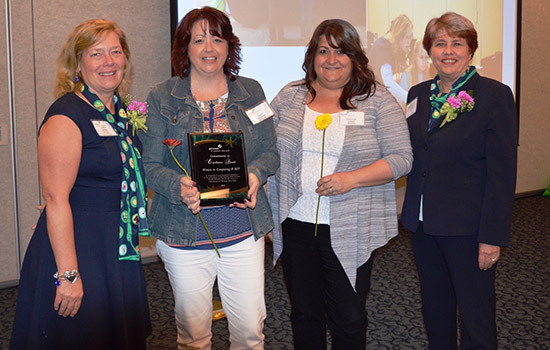 Attending the May 18 ceremony were, from left, Lettie Chilson, chair, GSWNY board of directors; Lana Verschage, director, RIT’s Women in Computing program; Deborah Jackson, WiC staff assistant; and Judith Cranston, GSWNY chief executive officer. Rochester Institute of Technology’s Women in Computing and Women in Engineering programs were honored with the Commitment to Excellence Award from the Girl Scouts of Western New York. The women’s groups were chosen for their dedication to encouraging young girls to pursue careers in science, technology, engineering and math—also known as STEM. The award recognizes an organization or business which has shown exceptional commitment to the advancement of Girl Scouting ideals and goals through dedication and devoted service at the council level. The Women in Computing program was recognized with a plaque at the Girl Scout Annual Meeting May 18, in Buffalo, N.Y. The Women in Engineering group will be honored at a later date. Girl Scout leaders noted the RIT events and programs provide girls with unique experiences that they could not get elsewhere. Programs hosted throughout the year include the Engineering Fun Days, Tech Badge workshops and the Girls Soaring in STEM Fair. Students in RIT’s Women in Computing Outreach Committee work hard to create opportunities for young women to learn about computing before high school, in a fun and engaging environment. The women in STEM groups at RIT include, Women in Science, Women in Technology, Women in Engineering and Women in Computing.